Rhett eats, breathes, and sleeps his stuff. Physics is on his mind all the time, humming away somewhere at some low frequency. And whenever physics floats by, Rhett knows how to bring it down, stuff it with a concise question, and mount it — on the wall of his blog, certainly, and presumably also in his classroom. He makes this look way too easy. reality, where Verizon doesn’t cover her school, where her digital natives don’t have cell phones, where few have encountered a blog in the wild. It’s impossible to have been a bystander in this struggle and not share her elation in her recent post titled I Finally Used the Cell Phones for Something, that “something” being a school-wide scavenger hunt, with students using cameraphones and MMS to verify their checkpoints. Kate doesn’t claim this is any kind of monument to 21st-century learning. But she is slowly and deliberately recruiting her students’ personal technology for academic use, introducing them gradually to implementations of that technology that our Leading Thinkers assume need no introduction. That struggle has come at considerable cost to Kate’s morale, as is fairly obvious from her grim, recent tweets. Let’s applaud her efforts, therefore, and encourage her to seize the rest of winter break for recovery. Education doesn’t have enough pragmatic adventurers to spare. 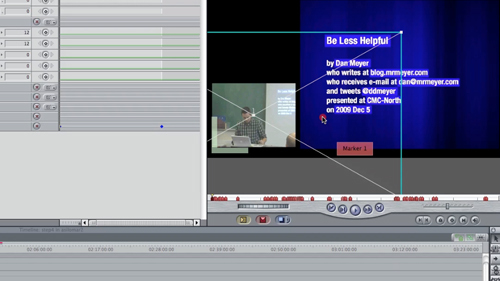 Professional Conference Video With Semi-Professional Equipment from Dan Meyer on Vimeo. 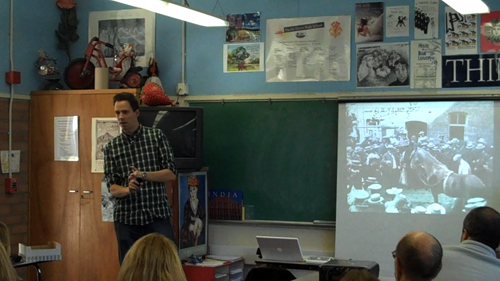 Two weeks ago, I posted the conference video from my CMC-North session. The slides were synced to audio, which is nothing new, but also to video of my delivery of the material, which appeared next to the slides. There wasn’t a camera operator at my session but the camera panned around with me anyway as I walked the room. I can review myself and make notes for my next session. This keeps with my intention to be as open as possible about my practice. My parents can call me up and criticize the clothes I wore. I edited a screencast explaining the process and posted it above. If you aren’t into video, here are some broad strokes in text. 1. Set up your equipment. You need something to record video and audio. I turned on an Olympus DS-40 lapel mic (which I’m not very happy with — suggestions?) and set a Flip HD on a shelf in the back of the room. Make sure your camera can see at least some part of your slides. Do yourself a favor: clap. With both devices running. Trust me here. Export your slides from Keynote or PowerPoint as high quality TIFF images. You now have these ingredients in a folder: audio file, video file, slides folder. Drag them all into a new Final Cut Pro project. 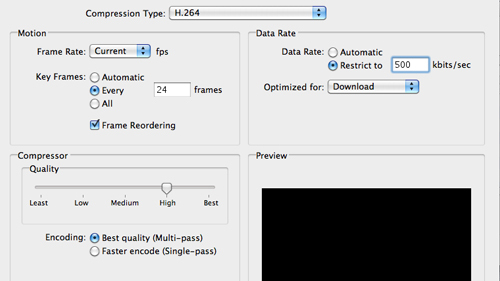 Then drag the video into a new sequence. Drag the audio in also. Find the clap in the video. On that exact frame, press M to lay down a marker on that track. Find the clap in the audio and lay down another marker. Position the markers on top of each other. The audio should now be fairly closely aligned. You may need to nudge the audio track forward or backward a few frames to get it exact. 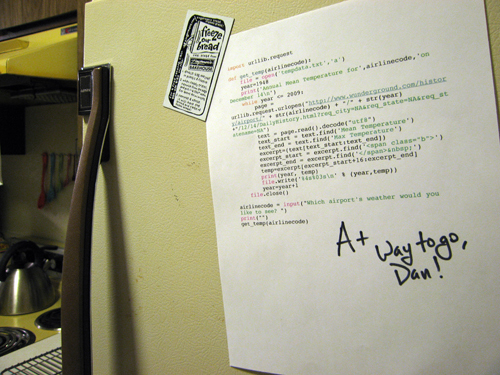 Press +1 or -1 a few times until it looks perfect. Find a good starting and ending point for your talk and then crop both ends using the blade tool. My Flip records video faster than my audio does (I don’t really get this) which means the sync gets really slippery by the end so I had to change the speed of the audio clip to 99.8%. Now watch your entire presentation. Whenever you change the slide, lay down a marker. 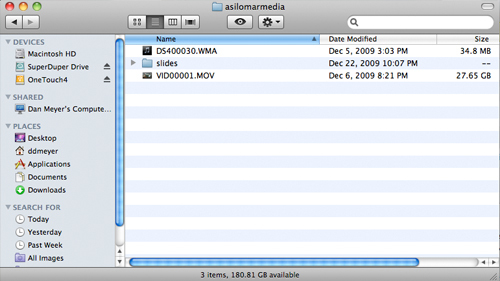 Then go into your slides folder and drag each slide to meet its marker. 4. Go back in time and hire a cameraman. Now you have really good audio and really good slides. The video is pretty good too but takes up way too much room. There’s lots of empty space around you which we’d love to crop out. Create a new sequence called “cameraman.” Paste in your video track. 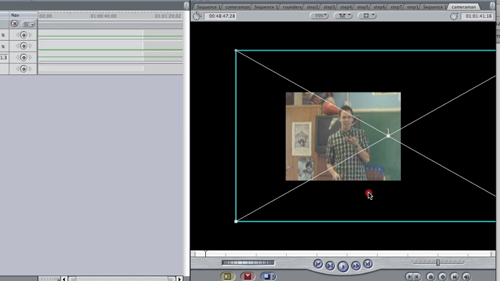 Go into Effects > Video Generators > Shapes > Rectangles and drag a rectangle on top of the footage. Change its Softness in controls to 0%. Go into Effects > Video Filters > Key > Luma Key and drag it onto the rectangle. Now you have a cardboard stencil on top of the video. This next part is almost impossible to explain in text and it’s also the most important so hit the screencast (approx. 7:00) if this doesn’t make sense. Position yourself in the frame. If you stayed in that small window for your entire presentation, bully for you. You’re done. But if you paced around like an angry hamster (as I do) you need to set a keyframe for center in the controls tab. Then, whenever you start to move out of the frame, set another keyframe for center. Once you stop moving, reposition yourself in the window and set another keyframe. 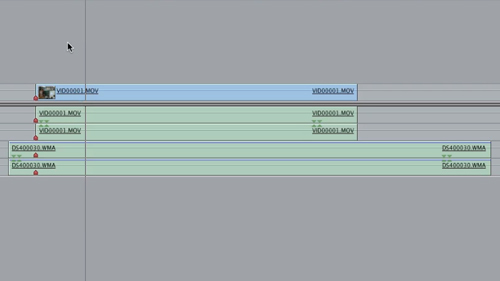 Final Cut Pro will “interpolate” the middle passage between keyframes making it look like you had a cameraman panning around with you the entire time. Nice! Keep doing this throughout your presentation. Drag the cameraman sequence from the browser on top of the video track in your original sequence. One should replace the other exactly since they’re the exact same length. Now you have great slides, great video, and great audio. The slides cover the video, though. So select all of the slides. Go to Sequence > Nest Items. This will let us manipulate them all at the same time. Right-click on the slides sequence and go to “Open in Viewer.” Go to Controls > Motion > Crop and bring the right and left edges in to meet the slides. Now in Controls > Motion > Scale, bring the size down a little. Then drag the cameraman track to the lower left of the frame and your slides to the right, creating equal space around them. The goal in the export is to sneak your video beneath Vimeo’s 500MB upload ceiling on its free account. Modify Vimeo’s recommendations. Keep the audio at its highest quality but you’re going to have to sacrifice video quality, which isn’t really a big deal because the video track is dominated by huge slides that don’t change very much. I set the bandwidth restriction to 500 kbps. You’ll have to render a lot and the final export will lock your machine up overnight. But this process is great because it frontloads the easy stuff and backloads the difficult stuff, which is exactly the right balance when you’re giving a presentation, when you don’t want to focus on complex technical details. I post this tutorial because, selfishly, I hope other people take me up on it so I can attend more interesting talks without having to leave my living room or brush my teeth.